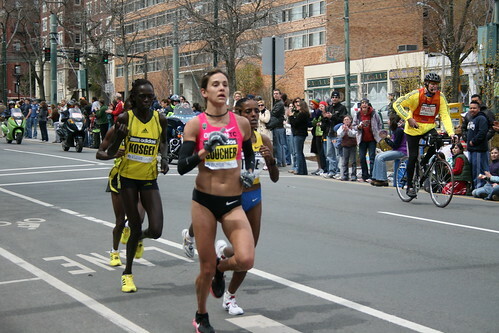 Kara Goucher wanted to win the Boston Marathon for all of her American fans. But we just wanted Kara to win for Kara. Our hearts broke—for her—when she finished third, but we all knew she'd be back for first place finishes and plenty more success in the years to come. Kara knows that, too; she's ready to move on from that almost-did-it pain she endured on Monday—and on to bigger and better things. I had the sincere pleasure of chatting with the charmingly candid, genuine and humble speedster yesterday afternoon. Friends, she left me with an even bigger case of Kara Goucher–fever. You've been warned! Kara: How are you doing? I heard you ran the Boston Marathon, too! L: Oh, thanks! I did, yeah, I did. I feel really sore, my quads are crazy-sore. But how are you feeling, how’s your body doing? K: You know, it’s actually doing really well. My hip flexors are a little sore. L: Do you think that was because the pace was a little slower than you expected? K: Oh yeah, absolutely, I mean, I thought we were going to be five minutes faster through the half point. I think because of the pace we were running, all of those women will come off of that better than we would’ve any other year, because if we had gone the pace we had trained to run it would’ve beat us up a lot more. Right now, I’m like I’m invincible, but I think after my next marathon I’ll be like, "Ohh, that’s right." L: And why do you think the pace was slower than everyone expected going into it? K: I think there were a lot of people that wanted that win so badly. And it was windy and people knew that whoever went out and led was going to pay. And there was some personal stuff going on between the two Ethiopians and they weren’t going to lead they were going to wait and out-kick each other. Anytime anyone got out in front they immediately came back, they didn’t want to lead. It was very breezy and it was obvious whoever got stuck out front was going to pay. I think Collen De Reuck from the U.S. ended up doing a lot of the work and she did a really, really great job and she finished well considering the fact that she had to break the wind for so many people for so long. L: In your post-race interviews you said you felt in control and your legs felt poppy…so you were ready to dig down and kick. But then it wasn’t there, why do you think that was? The wind or being out there for too long? K: I think that probably, even though I felt really good, I led on the windiest stretch on the course. And I think that I was so excited and felt so good and I was drawing so much energy from the cheering. I still thought I had a kick…even when they went by me I thought, “No, I’m still in this." And I think that it was a tactical error, something that I’ll learn now. It doesn’t matter what pace you run, you’re still out there running 25 miles. I think leading into the wind and pushing it, even though I thought I was controlling the race, Tune and Kosgei were just gathering themselves and getting ready for the kick while I was out there [leading]. I kept looking over my shoulder and watching people drop off one by one. I felt like I was controlling it but in the end I was just helping break it open. L: You said your body is feeling pretty good, how are you feeling emotionally? K: Um...I feel heartbroken a little bit, still. I’m proud of how I ran. [Voice breaks.] It makes me emotional…just all of the support I received and all of the people that wanted to see an American win so desperately. And I just wanted to deliver so badly. I just…if I would’ve been a distant third I think it would be easier to swallow. And they ran better that day and I would never take away from them at all but I feel like I did make a tactical error. It’s hard to let go. It’s still too raw right now. L: You ran a great race and everyone is so proud of you, but I can’t even imagine how it feels being that close and finishing third. L: What did Adam say to you right after the race? K: Adam was so great. He was there right away. He was like, “It’s okay, it’s okay.” He didn’t say, “Oh, it’s silly you’re upset—you just got third.” He said, “I know how badly you wanted it.” He did keep reminding me how far I’ve come—that I get third at the Boston Marathon—and here I feel like it’s a disappointment, you know? He kept reminding me of all of the positives but he never said, "You’re being ridiculous." He’s just let me be sad and let me get out my frustrations. L: You went to Niketown afterwards and did a special event, was that hard to pull it together? Did you want to go back to your room to decompress? K: Actually going to Niketown was very cathartic. I got to see people who had run themselves and they were so nice. My fear was all of this hype and then I didn’t deliver. I just want people to keep believing. It was so good to go there. I got a lot of hugs and a lot of people saying they believe. It was actually really, really good for me. L: I’m curious how you thought the NYC course compares to Boston? K: I actually thought that New York was tougher but it’s hard to know for sure because I wasn’t in as good of marathon shape for New York and I wasn’t as confident that I could handle it. And the pace went out a lot faster. Besides our first mile, which was slow, Paula took over and really just started to slowly pick it up, and pick it up, and pick it up. So New York was actually physically harder. I love New York, it has a personal connection for me. It’s hard to say one is better than the other. People were cheering for me a lot more in Boston. I felt more of the “I’m- doing-it-for-my-country" in Boston. That might’ve been because people knew who I was because New York was my first marathon. I think that as far as strictly running I was in more of a rhythm in Boston, because really there’s only three turns on the course, whereas in New York you take a lot more turns, it’s constantly changing up. But they’re both extremely challenging and they’re both extremely amazing, and one isn’t better than the other—I love them both dearly and I couldn’t pick one over the other. L: There was a lot of buzz after Boston that you were feeling good and like you could run London this weekend. Is there any glimmer of hope for that? K: Actually, about an hour ago my coach and husband and I had a conference call and we finally laid it to rest. I ran yesterday and I ran this morning [thinking I might do London]. In the end it’ just [too much]. Literally just an hour ago. [London] is done. L: Does this make you want to run a Fall marathon? Like, Chicago for instance? K: I would love to run Chicago, I would love to do the trifecta here in the United States. But I want some things out of my personal life. Right now I'm eyeing...what’s the best move to get what I want out of my personal life and still set myself up the best I can for winning the Olympics in London. I’m considering one more race, but it would be before Chicago. L: You’ve been really candid with the press about that. Did you feel like it’s something you just wanted to be open about or did you get sick of people asking you? K: People wanted to know what my exact [racing] plans were—and I didn’t really have any plans because I was like, “Well I know I want to try to have a baby in the next year or so.” Between my coach and Adam and Nike and I, we all knew that at some point in the next year I wanted to take time off, but I just hadn’t really made plans and I wanted to see how this race went. And my coach was saying, “Tell them you want to do this or that or…” But I…just…I can’t lie! So finally [Alberto] just said, “You know what? You should just tell them you want to have a baby. There’s nothing wrong with that!” I can’t believe how [big a deal it was to the press] but at the end of the day, it’s the truth, I want to have a baby and I want to have a baby in the next couple of years. It’s going to happen, I will take a break from running. And that’s fine. If people know, it’s fine. L: Is there any part of you that feels like it will be hard to put the running on hold? K: It is hard. I think that when I finally do have a baby I would laugh that I would even say that now. But right now it is difficult because all of these dreams I’ve had for so many years are being realized and it is hard to say, but what do I really want out of my life? Because right now running is so gratifying and I love it so much and I don’t want to step away. But I also know that if I really take two steps back and look at what I want out of my entire life, I know that I want to have a family. Picking the right time is very difficult, because I’ve switched it twice now and am considering switching it again. So it’s just hard. L: If you were to do another marathon, you’re thinking one that hits over the summer? L: You compete at so many different distances, all the way down to the mile. What is it that you love about the marathon? K: I love running the marathon the most because it connects so many people. So many communities and so many cities have marathons. And so many people get to be involved and so many people get to run. It just transcends. I love being an elite athlete, I loved running in the Olympic games, it was a thrill for me, but I would place it behind both of my marathons for sure. Because I got to be a part of something so big. And people got to be part of it, as well. And it’s not like I’m just watching on TV or sitting way up in the stands so far away. They could be right there on the rail cheering for you or they could be right behind you in the race. People get to be a part of it more. I love it. L: You didn’t expect to wind up as a marathoner, your coach sort of helped you discover it. Has there been a physical or mental breakthrough for you that’s helped you really excel at this distance? L: What are you up to now that Boston is over, relaxing? K: I’m in the Nike offices in New York. Tonight I’m flying back to Portland. Tomorrow I’m going to go sleep in, probably get some Krispy Kreme and hang out with my friends. L: With your recovery, what are you eating and doing physically? K: I ran yesterday. It was for my heart. This morning I ran just because I was thinking, "Maybe I’ll still run London and I need to stay loose." But now that that decision has been made, I won’t run again for probably two weeks. And really this is my time to just be a normal person…to sleep in. I was telling my husband I’m going to go shopping now! I’ll meet friends for lunch. I’m going to go back to my hometown and do some stuff in the community there. But I’ll just take advantage of this time and be a normal person. Be with the people I love to be around. L: What were your runs like? K: Yesterday I just ran 25 minutes, at a pretty good clip—I felt pretty good. But it was really an emotional thing. And today I jogged very slowly. And I never would run after a marathon normally. It was just because…yesterday I was still really emotional and today I was like, “Well I still might race and I need to do this.” But normally I’d take two weeks off right away. Two weeks will start tomorrow. L: Will you do any exercise, like ride a bike or swim or take long walks? K: I’m just going to chill out. I might go for walks, but no actual working out. L: After the race did you have dinner or do anything special? K: I went out with my family. We had a big dinner and I drank a lot of wine. And when we got into New York last night I ate a bunch of black and white cookies. You know, I’m not very strict with my diet anyway, but I won’t eat as many fruits and vegetables in the next week as I normally do. I’ll be more likely to indulge a little bit. I’m a person that doesn’t really restrict anyway but I will eat a little more than I normally do….a little more ice cream and cookies and stuff. I’ll have three or four instead of one. L: Those flag barrettes you wear for big races, do you have a bunch of those? Can we get them online or in a store? K: They’re still the same ones that my friend bought me in Japan. They’re all rusty on the bottom. I would totally invest…I’d buy like a 100 if I could find them somewhere. But unfortunately that’s where I got them. I love them! L: Your Phiten necklace, I saw you wore that again in Boston. Do you have a couple of those, are they getting ratty? L: So you wear it even when you’re hanging out with Adam, say, cooking or out to dinner? K: When I’m out to dinner and stuff I usually put it around my ankle and hide it. Right now Adam just showed me his and it’s under his jeans on his ankle and right now I’m wearing a bracelet one instead of a necklace one. Because it doesn’t always look great with my outfit. I do always have it on, it just might be hidden. L: While I was running the Boston course I saw all of the Nike cheering stations where they had Kara posters and people wearing navy Kara tees. What’s the experience like for you to see that as you’re running by? K: It feels unbelievable that people that people are holding a sign or wearing a shirt that has my picture on it. When we ran through Wellesley that’s where we had the first crop of people holding the signs. I literally had to close my eyes because all I wanted to do was take off running for them and sprint for them. I just closed my eyes and soaked it in. It’s amazing, it makes me feel really loved and supported. That’s why I was so emotional [after finishing third in the race]. There are so many people that I’ll never meet that are pulling for me and rooting for me and that’s an incredible feeling. L: Was Wellesley your favorite part of the race? K: That was awesome, but I really loved the whole thing. Two days before the race I went to a track to do some strides and there was a little girl there with her dad, high jumping. And at about the 16-mile mark I saw her with a gigantic Go Kara sign. I mean, that was awesome. I was hell-bent on not waving and not getting over-emotional in the race. But I had to wave to her. The whole thing was awesome, there was no one point that was sweeter. It was loud the whole time. I just felt amazing. It was such an incredible experience. Photo grabbed from Stewart Dawson at flickr. I think my Kara fever just intensified. Great interview Liz! Though I'm a bit late finding and reading this article, I thought you guys at FI did a great interview. Kara Goucher sounds really *really* cool and very down to earth. Here's to her first gold medal!